Camping 101 - How do you do it? From about 18-24 I was a camper whether it was a weeklong campout in one spot, lake side or a backpacking trip in the New Zealand mountains. My best-friend Emily and I never stayed in hotels; we had all the gear for camping and we took full advantage of this at every turn. I had the mentality of camp or bust which helped me to see a lot of the world for very little and also, I think, relax (nature has a calming effect on me). When I moved to America in 1999, I was initially in Tennessee then Kentucky. Wanting to move to SEattle so badly and being broke, the only way to drive across country was to do it by staying at campgrounds. No problem, I thought, I’ve camped a lot. But this trip happened years and years after regular camping. The gear I had was cheaply made and lots of essential components were missing. That meant when camping in Kansas, the winds beat like a heavy drum against the tent all night. I froze in the Colorado mountains and was soaked in the Grand Tetons. Needless to say, camping wasn’t that much fun. I essentially gave up on camping over the years – not because I lacked interest but because comfort began to mean more as I got older and having the financial ability to stay at four star hotels made me less inclined to sleep on dirt. It wasn’t until this summer when a friend suggested we go camping – and he said he’d bring all the gear and food – that I went again. 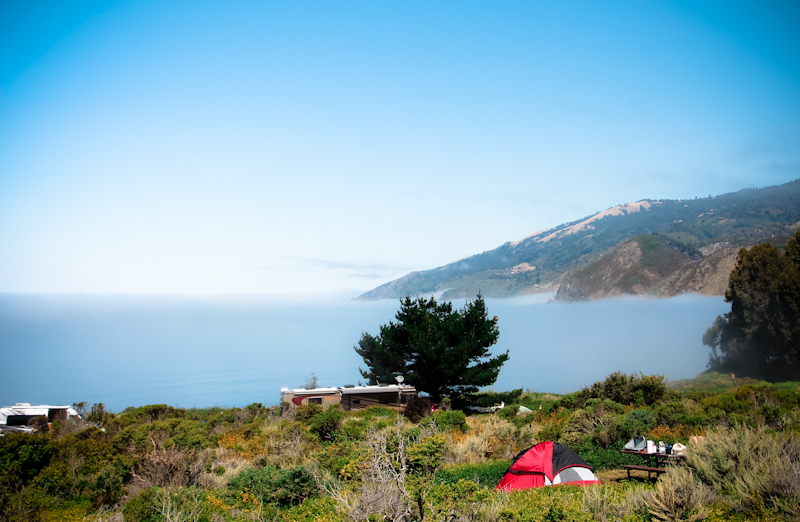 We camped in Big Sur CA with a million dollar view and ate by camp firelight every night. It was a good first trip that reminded me why I loved camping in the first place. But it also reminded me that camping now requires some basics – and some comfort – that I’m not willing to compromise on. Call it glamping if you will but I need to have camping feel as good as possible from knowing I have the right tools (and always put together in a kit for easy access when I want to go camping) to having the right gear (a great tent, blankets, food prep etc). There’s several camping trips already planned for this year so in preperation I’d love your help on building my camping gear kit. If you’re a camper, what are your tricks, your essentials, your ‘things that just make it better’? Tent supplies (lights, sacks, cleaning etc). How do you prep/keep food? What food do you bring? Extras that make camping better? Next Post Spring clean thoughts. I’m a camper from way back, as well. These days I find a nice foam pad to sleep on is essential. My “box” for camping was once a list that I kept secure and updated after every trip with details. I used this list when preparing for the next trip. These days I keep all my stuff in the shed on shelves, ready to pick up. I doubt it’s possible to have things ready to go at a moment’s notice. Something always breaks, rusts out, or is in worse condition than remembered. The most essential item to pack is a sense of fun and some patience. Have fun! your timing couldn’t be more perfect! i was just in rei this week perusing the aisles looking to build a camping ‘kit’. i really want to camp this year with my 7 year old and thought if i start building my kit now, it wont be such a drain on the pocketbook – I can buy a few things here and there and when summer comes we’ll be ready. where did you stay in big sur (if you don’t mind me asking)? Looking forward to reading others answers to this! As kids we begged our parents to take us camping. It wasn’t until 8th grade they finally said yes and we learned our parents had been holding out on us. They had EVERYTHING — an epic 2-room tent with screened in porch, bunk bed cots (! ), folding camping tables and chairs, the works! Turns out they used to go camping pre-kids and had tons of retro, but well-preserved gear. A few tips I learned from Mom: bring a broom and a “welcome mat” for your tent to keep dirt out and bugs away. I think Mom spent the entire weekend sweeping. And treat yourself to a nice air mattress and good pillow. 1- A camping list to keep on your computer. Print it out every time you go on a trip and modify as you go along. 2 – Sleeping bag liner – I love these. They are great for adding a few degrees of warmth when your sleeping bag won’t cut it or using as a stand alone when the weather is warm. 3 – Always bring more garbage bags than you think you need and extra flashlights, ditto for batteries. 5 – Deck of cards or Uno, especially if there are several of you. 6 – I found that I get more mileage from several smaller, thinner bath towels than one big, thick bath towel -as it takes longer to dry. 7 – Bringing a dog – a long lead to tie around the picnic table if he/she is not good off leash. 8 – Earplugs!!!!! I was the only one who got sleep one night at Pokagon State Park. The rest of the family got to listen to one camper get very drunk and very loud for a very long time. I believe a ranger finally interrupted his rants against the government. 9 – No earplugs – There are no noisy human neighbors but you want to be woken up for animal visitors such as a black bear who wakes you up in the middle of the night trying to find the salmon you naively cooked at your campsite. 10 – DONT’T cook salmon at your campsite in bear country. I think I used up my life’s allotment of “Get out of jail cards” for that stupid mistake. God was looking out for me that day, probably shaking his head and saying “I don’t know why I bother sometimes.”. I love camping! I have some suggestions for supplies, having gone backpacking (where literally everything you need is on your back) and car camping. If you want to “glamp”, the first thought I had was to go get a self inflating airbed – instant comfort! I also like having fresh coffee while still inside my tent, without having to step out into the cold. So, I always pack a “pocket rocket”, so called because it literally fits into a 3 inch plastic case and folds outs into a stove. You just attach the fuel can on the bottom. I set my small very lightweight kettle (all from REI) and boil my water in no time and pour it into my french press made for camping (again REI would have those). I also have a Coleman dual burner stove which packs itself up into a green metal “briefcase.” I think a simple lightweight fry pan is essential for cooking on the stove, as well as a spare barbecue grill grate to put on top of an open fire. I think the rest of your food should be what you can cook over the fire or wrapped in foil. I would suggest making pancake mixes and packing it up in plastic bags, eggs should be secured in a plastic egg case, meat already marinated before you go and packed and kept chilled in a cooler, Spices and coffee/hot cocoa stuff should be packed in labeled plastic bags instead of their original container. I would also get a Coleman foldable plastic water “tank” which has a spigot – useful for washing hands or for drinking water. Don’t forget first aid items such as antiseptic foam in case you snag yourself on rusty barbed wire (yikes!) I think that one can have a “luxurious” camping experience packed into a backpack (tent, sleeping bag, clothes, pillow blanket, first aid kit, stove, coffee supplies, water shoes, socks, sneakers, headlamp) and a Rubbermaid tote for the bulky cooking supplies. A headlamp is better than a flashlight because it keeps your hands free. Also, a Swiss army knife. My tent is a backpacking tent, which means it is designed to fit inside a backpack, very lightweight but comfortable (again REI). If you don’t have any qualms about shopping at Walmart, they are the only one I know that has an extensive collection of Coleman camping products. And by the way, if you want, Coleman also sells a long fork with a wood handle — for making s’mores! (Long wood sticks are neither sanitary nor easy to find). How fun!! Layers! They are my absolute must-have. I have ended up soaking wet in New York winter weather, and extra layers were incredibly important/life saving. Sometimes I take too much, but I’d rather have too much than not enough. A GOOD rainjacket/poncho (generally not the five dollar kind), and great shoes (because I mostly go backpacking/hiking). I also love fun camping things- like sporks. Partially because I enjoy saying “spork,” and partially because it cuts down on pack heft. Food is also important- it keeps you warm from the inside out. If I go winter camping- butter. Old school survival trick. For regular camping- chocolate. 1. Jetboil. If you’re backpacking, its compact and simple. If you’re car camping, its still great to have boiling water with minimal hassle. 2. Exped air pad. After numerous nights of freezing on a thermarest (I know, ironic), I gave an ‘air mattress’ a go. Exped makes some quality pads. Mine is an insulated air mattress, which means you get the cushion of air with the insulation akin to a sleeping pad. Plus, mine is huge (long, wide, thick) without being too bulky to pack. 3. Camp chair. Crazy creeks are my favorite, but non-ideal if you’re camping somewhere wet … then its worth it to have something that keeps you off the ground. 4. Puffy jacket. I’m always cold. Always. So an enormous green down jacket that packs into a little tiny stuff sack is my favorite camping companion. Camping! Goodness, we’ve got our gear down pat now. I was never a camper – my mom’s idea of camping, she claimed, was a 4-star hotel. It wasn’t until I started dating my husband that I got my first taste of the great outdoors and completely and totally fell in love! The biggest help we did was we bought a few clear storage containers – one always holds our food supplies (utensils, bowls, plates, cups, foil, salt/pepper, tablecloth, etc) plus paper for starting the camp fires, a candle lighter, matches, etc. We have another that we store our lanterns, flashlights, tent stakes, tarps, etc in. And the others we use for our towels, blankets, etc in case it rains on our way to the campground (We have an open-bed truck so it happens sometimes). Before it took us forever to find all of our gear and pack… now we just grab a few containers, pack our bags and towel and blankets, and hit the road. We pack our cooler with some things from the house, but we buy our freezer food stuff (we do chicken cut up with veggies like potatoes and carrots and onions in a foil pack) from the town we’re camping in. It’s just easier than worrying about the cooler not staying the right temperature to prevent food spoilage on those things. We have a picnic backpack that I bring with us to throw some sandwich stuff in for our lunches as we’re usually out hiking during lunch so we have stuff on-the-go. Wow – thanks everyone for all your ideas and suggestions! I’ve put a list together of things to get and will share an updated post soon!